On Sunday night, we got home from a three-week trip halfway across the country and back. In twenty days, we visited twelve states and drove over 6,000 miles. We visited roughly twenty-four friends (ten families), stayed in five hotels, one airbnb apartment, and in some of the most pillow-filled guest rooms imaginable (especially amusing since we packed our own beloved pillows and slept on them happily every night). We woke up at 4am in Albuquerque to see the first exquisitely peaceful dawn patrol of the city’s famous hot air balloon fiesta. We stayed out way too late in smoky jazz clubs in New Orleans. We played board games with my husband’s best friends from college, and watched his team win their homecoming game in the rain. I have a tiny clay “puppy” given to me the very first night of the trip by a new young friend, carefully protected from the ravages of the road with toilet paper wrappings, and I have beautiful autumnal pictures of Temple Square in Salt Lake City (mere blocks from where we had afternoon beers with friends who used to live down the street from us). We stargazed in Arches National Park and had catfish and green chiles and grits until all we wanted was something green. It was a wonderful trip. Exhausting and ridiculous in its scope, but still precious. And because we were driving, I was able to justify buying a few books to add to my collection, although admittedly I forgot about most of them as they were lost under the detritus of car travel. This one though, this little volume of photographs, I’ve been carrying with me since New Orleans. My husband found Hurricane Story when we went to an after hours event at the Ogden Museum of Southern Art. We’d spent two hours wandering around the museum, mostly exploring the Gasperi Collection (self-taught, outsider and visionary art) while half-listening to the band that had been booked in the lobby (extremely loud punk-jazz…is that a thing? It’s what they sounded like). It was our last night in the city, and we’d spent the past few days digging into the history of the region (an absolutely fascinating part of the country I had known virtually nothing about). I suspect that’s why I was so taken by Shaw’s story. When Hurricane Katrina hit in 2005, I remember the overwhelming imagery of a ravaged city, but I had neither been there, nor knew anyone living in the area, and it felt very removed from my life. I had no frame of reference for what was being lost, or even (despite the hours of news I watched) how it could be happening. Levies and wards were words that meant almost nothing to me. It wasn’t until I was walking the city, listening to people who had lived there for years, and exploring it for myself that I truly appreciated both the devastation and the resiliency of the community. New Orleans is a fascinating mix of uninhibited exuberance and solemn tradition. The beads and the drinks and the food are shiny paper on a city that deserves to be unwrapped and appreciated more deeply for its political and cultural history. It wasn’t my favorite stop of the trip, but it is where I learned the most, and thought most deeply about many troubling aspects of our nation’s past and present. Shaw’s book added another dimension to my perspective of the city. I finally got to read about the hurricane nine years ago through the eyes of an artist, rather than a reporter. 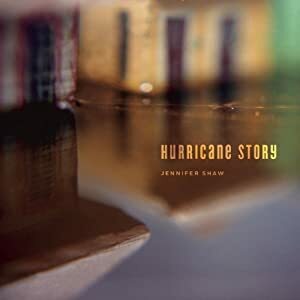 For more about Jennifer Shaw, go here. Felt a special connection to this post since I am a big road trip fan. The places you write about are very familiar. New Orleans included. This book sounds perfect while in the Big Easy. You’re right about New Orleans being a strange mix. I love it, partly because of my French origins, mostlly because of the history and the rebellious side of the city. Actually a lot is to be seen across the whole Louisiana state. And the people and the way they speak win me over each time I get to go. Thanks for sharing with us. I agree! One of the most unique states I’ve been to! Louisiana is definitely a place that bears further exploring. Maybe in the winter though – I was not born for that kind of heat and humidity!